Last Friday, I co-led a presentation on single-board computers at the 2013 CUNY IT Conference. Since it was a very well-attended session (where we had great discussions with the attendees), I thought I’d provide a brief recap and link to the presentation material. Once the audience was thoroughly confused, I explained that the BeetBox is a quite literal “beatbox” that uses beets as percussion instruments. To achieve this, there are touch sensors in the beets that are wired to a Raspberry Pi. To emit the drum sounds, there is an amplifier and a speaker also hooked up to the RPi. There is a Python program that’s running on the RPi and translating the touches into drum samples. The RPi powers this apparatus behind-the-scenes. But what is a Raspberry Pi? It is a type of microcomputer. So what’s a microcomputer? It’s a single-board computer that’s small, cheap, and open source. It’s about the size of a credit card and varies in price from $25 up to $100. As such, it’s quite an affordable little machine, containing all the parts of a functional computer: microprocessor, RAM, I/O, power supply, and so on. The most popular microcomputer—at the moment, anyway—is the Raspberry Pi. It’s $25 for the base model and $35 for the “souped up” version (with more RAM and ports). Another one that comes up frequently is the BeagleBone (brought to you by Texas Instruments, the calculator guys) and it’s quite a bit more expensive at $89. And, the one that’s been around the longest, is the Aduino. They have several boards but the Uno board costs $30. But why should you bother to do any of this? Well, there are actually uses beyond recreation. In fact, there is evidence of more and more applications in academia. My colleague Junior discussed uses in the classroom while Robin explained how microcomputers can be used in and for research. Steve discussed the benefits of teaching microcomputing techniques and explain why computational literacy is becoming more important in today’s world. The presentation was then rounded out with demonstrations of projects that each of us had constructed, followed by questions from the audience. 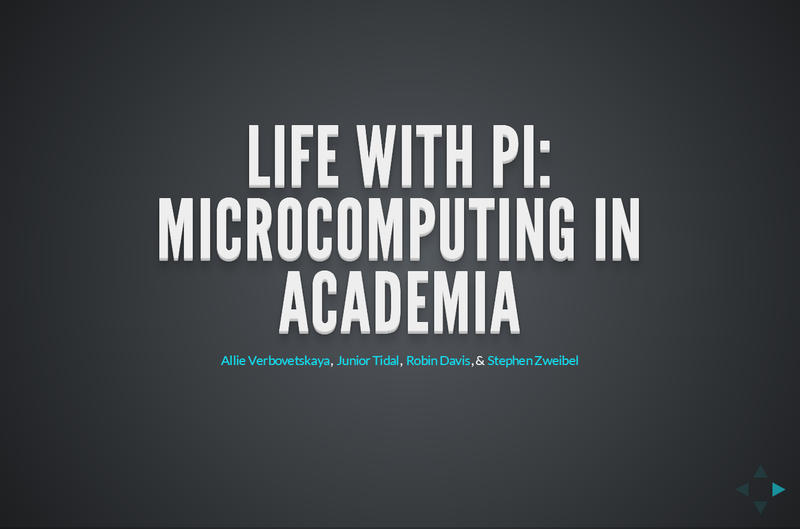 You can also see Junior’s write-up of our presentation for more information about his section: http://juniortidal.com/2013/12/life-of-pi/. For a complete overview of Robin’s contribution to the presentation, see the write-up on her website: http://www.robincamille.com/presentations/microcomputing/. Steve discussed the importance of computational literacy and how microcomputers can be used to teach this literacy to the next generation of learners. He defined “computational literacy” as the ability to use computers and computational technologies to solve problems, and explained how it supports algorithmic thinking and collaboration. I discussed setting up a personal Dropbox-clone using an ownCloud instance on a Raspberry Pi-powered web server, to be used as a classroom repository or just a safe place to store potentially sensitive materials. Junior demonstrated his “auto-citation” project. Using the Open Library API, he created a script that makes it possible to scan an ISBN (or enter it manually) and get a citation (in APA, MLA, and Chicago styles) in return. Robin showed a light level logger, wherein she used Python to read data submitted by a 95¢ photocell sensor wired on a breadboard (hooked up to a Raspberry Pi). Steve described the concept of a LibraryBox (digital file repository available via its own Wi-Fi signal) and encouraged the audience to connect to his LibraryBox network and download some documents to see his project in action. The slides are available online: http://www.robincamille.com/jj/cunyit/. We also created a handout that was made available at the presentation. You can download it from http://www.robincamille.com/jj/cunyit/handout.pdf. The four co-presenters worked on this presentation collaboratively using git and a shared repository on GitHub: https://github.com/szweibel/CUNY-IT-Presentation. It was the first time any of us has used GitHub in this manner and it proved quite successful. We used the reveal.js presentation framework for our slides. It’s very easy to use and provides beautiful (and responsive!) slidedecks. Alevtina Verbovetskaya is the Web & Mobile Systems Librarian in the Office of Library Services at the City University of New York. Copyright © 2019 Mobile, she wrote.